Change the world in four easy steps with this intentional acts of kindness kit. Change the world in four easy steps with these intentional act of kindness kits. With the 26 cards in each, you'll find yourself picking up someone else's tab at a restaurant, writing a letter to someone who inspired you, picking up the trash on your street, giving genuine compliments and so much more! The coolest thing about Boom Boom! cards is that you can create a chain reaction of covert kindness that could theoretically travel around the world! 3) Pass the card on to anyone (a friend, a stranger, your mom). Created by Mary Beth Campbell (Chief Revolutionary Officer) and Helene Scott (Chief Creative Instigator) to incite an "uprising of guerilla goodness." Click here to read the story. Comes with calling card note pad and canvas carrying sack; pencil not included. Cards made of 30-100% post consumer recycled paper. Made in the USA. Original: Set of 26 cards that encourage you, your friends and passersby to act on good intentions. 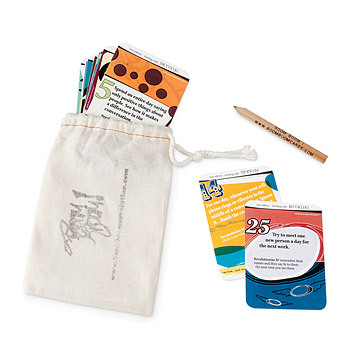 Family: Designed with children and families in mind, the Family Deck includes an interactive "Command Central" activity board with stickers to keep track of your Family's progress, discussion cards to inspire meaningful family conversation and do-it-yourself cards so kids can make their own. Teen: Playful prompts written for high-energy teenagers make motivating and inspiring goodwill a fun, everyday activity. Sold separately. Pencil not included. I found the product made a statement of responsibility in becomming a better person and reminded my selfish young son of slowing down those inherited dad side cynical genes to give a bit back. I will give this gift again! They cannot wait to get online and track some of the projects. Great gift for a family with 3 different age groups. Keeps families talking. Engagement in their environment, their community, and each other. Can't wait to follow around the world! Great for the friend who is always doing good and always inspiring those around them. I have never used this before, but I like to help the homeless and people that don't have internet access. So, I am worried the cards wont make it far. I am excited to do these cards and hope it helps make a few people happy at least. A great way to meet people. The whole idea is great. It brings people together and is a fun project. We enjoy using this on the weekends as a family. Really fun to do together!